Either to the sales department, in which case, prices and profitability tend to be lower than they could otherwise be. Or to the accountants, in which case, prices tend to be based on a cost plus mark up formula or the recovery of cost inflation. Neither situation is satisfactory as it results in a company failing to capture the true economic value of its products and services and consequently the company underperforms. When considering the pricing decision, it is critical to appreciate that customers buy benefits rather than products or services (i.e. a hole in the wall rather than a drill) and that they buy on value not price per se. Furthermore, not all customers are homogeneous. This means different customers will value the same product or service differently and are therefore prepared to pay different prices. 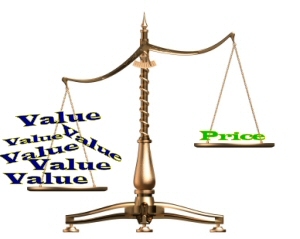 Customers always buy the product or service they perceive to represent best value. The customer’s perception of value is therefore always relative to the competition. Adding more or new benefits to a product or service enables a company to increase its prices providing these additional benefits are relevant and motivating to the target market customer. Adding benefits need not however necessarily lead to an increase in costs. Learn more about how to value engineering a product or service to achieve a higher value, lower cost win win. Unfortunately, in many companies, these relationships are rarely understood. Cost plus – with cost plus, a mark up is applied to the cost. Whilst being easy to administer, cost plus is an ineffective way to price as it ignores the value to the customer and the impact on profitability resulting from changes in price, margin and volume. Price taking – in markets where there are numerous small suppliers, the price is in effect set by the market forces of demand and supply over which no individual supplier has any influence. Price taking is common in commodity markets with undifferentiated products or services. Pricing is a business critical decision and one, where for many companies, there is considerable scope to improve economic performance.